In an industry saturated with dance songs and shaku shaku vibes, ‘Barrister’ Falz the Bahd Guy takes us back to the origins of Afrobeat, takes us on a journey through the streets, the courtroom, classroom and the sanctuary and forces us to question the state of humanity all in 25 minutes with his latest album entitled Moral Instruction. As Nigeria is in an Election year, America’s government is still shutdown, Zimbabwe is still on fire, Flint still has no water, politics are at the forefront all over the news in which Falz capitalizes on. Falz weaves the gap between artistry and advocacy with his album where he delivers one of the most critical albums of the year. And yes, the year just started! In the current state of hopelessness and corrupt governments, it is crucial to have bodies of art that deconstruct the political climate for the comprehension of all individuals from those who have never entered a classroom to those with Ph.D’s. His use of different languages – Pidgin, Yoruba and English – within his lyrics work as the stitches that quilt together this body of work to give it the ability to create stories that touch different audiences globally further opening the minds of all classes of citizens. Through his approach, Falz adds fire to a quiet revolution as he explains to citizens the essence of current matters while putting out mirrors in front of every single person within the population in Nigeria, and throughout the globe. As we shaku shaku through this life, Falz reminds us of our duty to utilize our voice during these times where silence is easier. Revolution or genocide? Through his album, he explores the state of humanity through themes of genocide, hypocrisy, corruption and greed then closes the album on a hopeful, resilient vibe. He deserves some accolades for this project because it is quite easy to slip into the zombie state of following trends in hopes to ‘secure the bag’, but Falz chose the route many artistes do not have the heart to take, and it appears he did so with ease. Falz takes listeners back to the era of the inception of Afrobeat with an album heavily influenced by the sounds of Fela and other revolutionary 70’s vibes. Each song is orchestrated with colorful sounds of trumpets, horns, percussions and/or background vocals as the canvas for the images Falz paints with his lyrics. Production wise, the blend of history with contemporary sounds creates a complex vibe that complements the words in each song. Thank you Sess, Chillz, Willis, TMXO and all the amazing background vocalists for these musical vibes. To open the album, Falz highlights the genocide happening in Nigeria, and throughout the Diaspora, in his song titled ‘Johnny’. Arguably, ‘Johnny’, is the most important song off the album because it introduces the several themes other songs breakdown thus making it a valid tone setter for the whole album which is very important for any concept project. Listeners become historians as well as witnesses to the murder of ‘Johnny’, a metaphor for all individuals who have been killed by Boko Haram, suicide bombers, law enforcements, neighbors, etc. ‘JJD! JJD! Johnny Just Drop!’ introduces listeners to the project as background sounds leading up to the artist’s set of lyrics, ‘Johnny Just Drop/Na person shoot am down/Johnny wey dey innocent/Johnny wey dey new in town/They kill am for Jos/For no just cause…’ to rewind time and bring listeners back to the tragic massacre in Plateau State last year where 86 people died, five injured and 50 house burned in the name of religion, or land, or animals, or all the above as many of us still question till this day. Falz makes it his duty to ask powerful questions – as a musical advocate – in search for the answers to the current state of humanity. 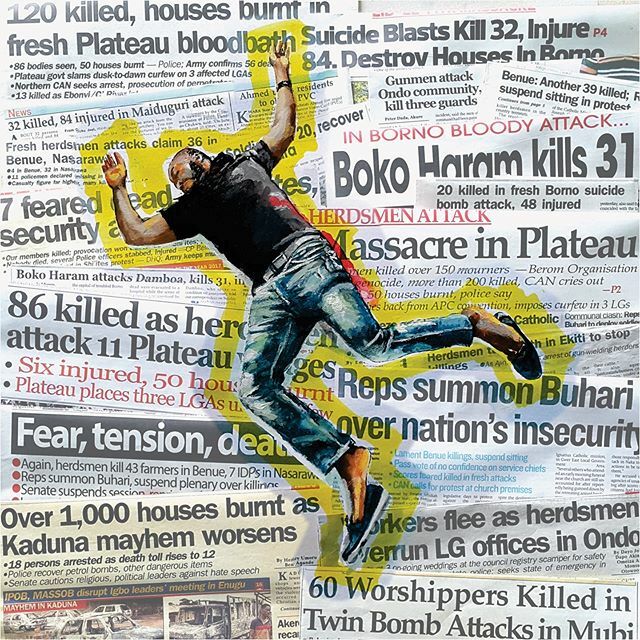 The artist directs his attention to the murderers and asks, ‘Shey na religion abi culture/Abi politician wey dey sponsor/wetin be the thing wey dey cause war/wey you no stop till dey draw blood?’ where the beat heightens and Falz flow takes on a faster speed to portray the urgency of this matter. The lyrics dance to the beat and his flow switches fluidly and forces listeners to pay closer attention to grasp the movement of his words and to grasps the essence of the matter; the genocide. In the second verse, Falz tells the story of a recently graduated corper who loses his life to the hands of a police officer aka Michael Brown, Trayvon Martin, Shantel Davis, Aiyana Jones. ‘Johnny’ goes from Johnny Just Come (JJC) to Johnny Just Drop (JJD) in a matter of minutes where Falz metaphorically uses this scenario to speak on the constant killings at the hands of those in authority who believe young life full of fresh dreams have little to no value. This moment juxtaposes the role of law enforcements and ‘Johnny’ in society. Law enforcers are meant to protect and serve the citizens of the nation; however, Falz words photograph the opposite. The interaction between Johnny and the officer is a complex issue that stems from lack within society. Lack of empathy, lack of equity, lack of respect, lack of dignity, lack of being vocal, lack of humanity and more, are all issues that show face in this song, but more importantly, in Nigeria. Falz sheds light on this crisis by unraveling its layers through robust lyrics pushing listeners to continue to question those who hold authority and to, also, question their own humanity and safety/security in their homeland. Falz ends the song with these lines, ‘Some blame it on religion/some fight for malu/Johnny drop for Lagos because some foolish man overdo/If Johnny continue to drop/Eyan melo lo maku/Eyan melo lo maku/Eyan melo lo maku?’ There are several said reasons why people are killing one another drawing listeners back to his prior reference back to the killing in Plateau State caused by the war between the Fulani herdsman and farmers who are also of different religions – Muslims and Christians. Through this, Falz creates a full circle and shows the repetition of history in today’s world while literally bringing listeners back to the beginning of the song implying that the story never really ends. However, the main question is ‘If Johnny continue to drop, eyan melo lo ma ku?’ In English, ‘If Johnny continues to drop, how many people will be left?’ or ‘how many people will die?’ depending on pronunctiation which Falz does play on in this specific part. He asks the question in three different tones – anger, sadness and exhaustion – highlighting the plethora of emotions and stress felt by him, the artist, and the people of Nigeria. There is a silent, but loud, genocide happening, and we must ask ourselves, when does it stop? How many people will be left if we allow it to continue? The choice is ours, revolution or genocide? Speak out or be silent/silenced? As we listen to Moral Instruction, it is necessary to pay attention to the words of the artist as he brings together a timely album based off the climate of Nigeria, the climate of the world, honestly. ‘Johnny’ acts the blueprint for listeners of what to expect in the album. It is imperative to highlight and understand how critical it is for artists to utilize their platform to speak out for the humanity of their supporters and their own Self. The album has eight other powerful songs in which I will speak on in other articles, but overall, the album does its job of social activism through music. From the cover to the images associated with each individual song to the production to the date and time it was released down to the final word of the album, Falz the Bahd Guy took his time to build and deliver the most essential album of the year for Nigeria.